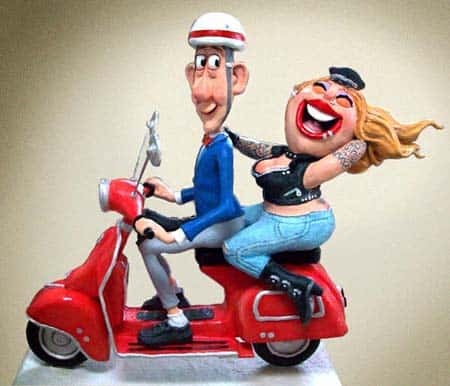 Today’s guest post is by Steve Sack, who shows us how he built “Born to be Wild,” his latest sculpture. Thank you, Steve! What a great post – and a great sculpture, too. Even though Steve says this “isn’t a tutorial,” I know his description of the materials and methods he uses will inspire all of us to try something new. Hello all. I was asked to share some pics of a recent sculpt, and describe my methods. This piece is called “Born to be Wild”. It measures 36″x33″x13″. It was a fun one to build, in spite of a few problems along the way. What follows isn’t really a tutorial, but does explain some approaches and materials I’ve found successful. I’ve only made 11 paper mache sculptures thus far so I’m not presenting myself as an expert. It’s always fun to see how others make art, so hopefully you may find something here that you may find interesting. 1—Rigid Foam—-I used rigid foam for the armatures in the last few sculptures I’ve made…I find it works well for my purposes because I like as much control as possible in my work. I don’t like the white pebbly styrofoam…I use the pink Owens Corning rigid foam panel insulation(the Pink Panther stuff at Home Depot)…it cuts easily with boxcutters, saws, small knives, files, or coping saws. It can be sanded smooth, and parts can be glued together to make larger shapes.. It takes Jonniclay well. My only complaint is all the little foam bits that seem to get everywhere. 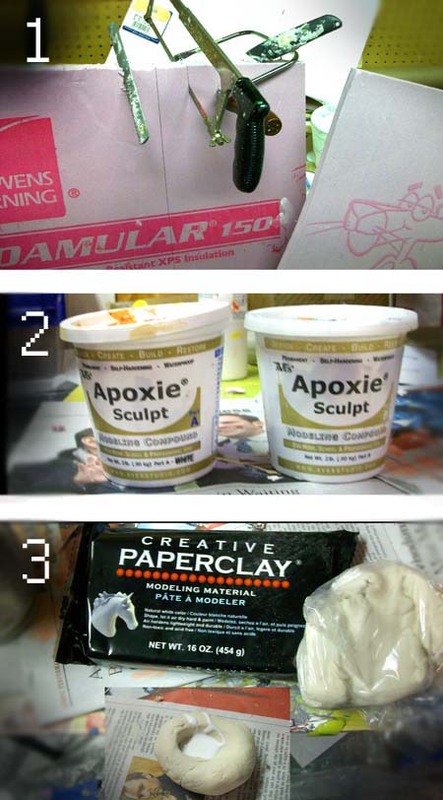 3—Creative Paperclay—…I use this for details only. it is a joy to model..even easier to shape than pottery clay. Dries pretty hard. I don’t use very much but you really only need it for details that are too hard to get with Jonniclay. 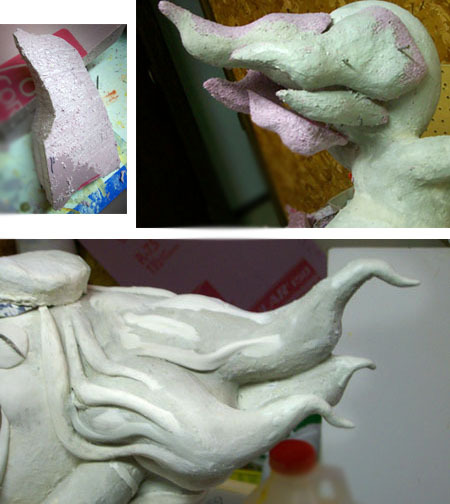 I keep the Creative Paperclay additions pretty shallow (for longer details like cattle tails and horns I use the Apoxy). Here’s how I use it: I take a small handful of clay, then add about 10% of its size in Elmers glue, kneading it together till its totally mixed (that step is messy so latex gloves recommended till its mixed together). You can see a dollop of the clay in my snapshot, with a bit of glue in the center before mixing. 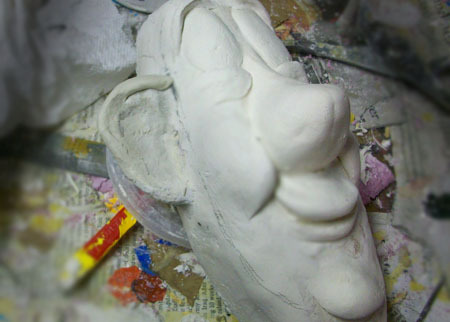 Then shape the Creative Paperclay into what you want to add to your sculpt….before joining them dip your finger in some Elmers glue and smear into the area on your paper mache sculpt where the Creative Paperclay will go. Then press together and blend. Once dry the pieces will be totally bonded, and can be sanded or painted. Also I use wood dowels and wire for armatures. I build my armatures as I go along rather than an entire armature skeleton from the start, because I tend to make lots of changes as I go along. I always start with a sketch…nothing too detailed.This one called for some reference photos, front and side views of a motor scooter. 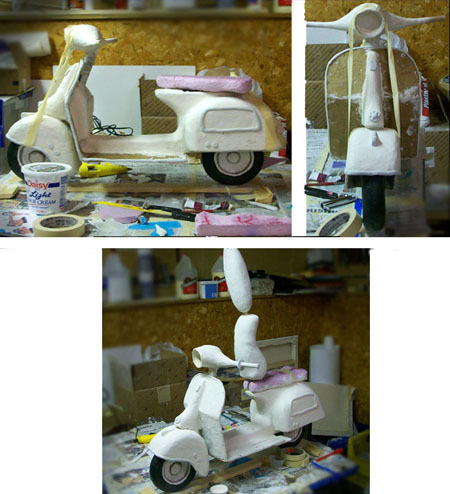 Because the concept was somewhat complicated I decided to build the scooter and each character separately, otherwise painting would be a nightmare. Building upward I shape rigid foam to the shapes of the motorbike’s fenders and chassis. Flat areas are cardboard reinforced with woodglue-soaked Kraft paper strips. You can see the carved bike seat awaiting it’s Jonniclay layer. The trim details are Apoxy. I roughly shape some of the character’s body parts, to get a sense of proportion. 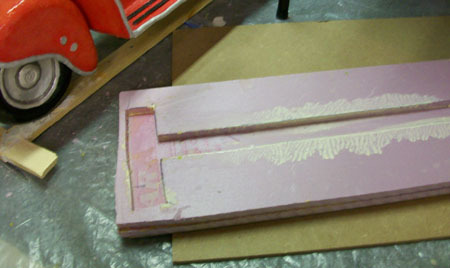 I wood glued some 1 1/2 rigid foam pieces together. After drying it was easy to carve the basic shape down with a coping saw, then form a smooth head shape with a file. A mouth then was easy to carve out. Pieces coming together…for larger ones I drill holes to stick in a glue-covered wood dowel. Some parts are kept in place with a nail stuck into the rigid foam…easily removed once the mache has dried. I don’t get too fussy with carving…just guesstimate rough proportions, carve a bit with coping saw or hacksaw, then do the bulk of the shaping with files. I realize my character is too stout and needs a longer waist. I slice her in half with a hacksaw, slip in a piece of rigid foam, file it smooth, and tape the pieces together before covering with Jonniclay. After drying for a few hours in front of a heating fan she’s ready to work on again. I frequently place the characters on the bike to check their poses in relation to the bike, and see how they fit together. Not for the squeamish……here I add an after-the-fact armature…drilling a hole with a long drill bit from her base up into her head.Then I slide in a glue-covered wooden dowel. Her hair had turned out heavier than I expected so I wanted to give it a little more support. Detailing a face with Creative Paperclay. You can see that really very little is needed, just a little ridge here or there. This stuff is great for detailing facial features. Also for clothes… just a small ridge is all that’s needed to make a convincing sleeve or hem. 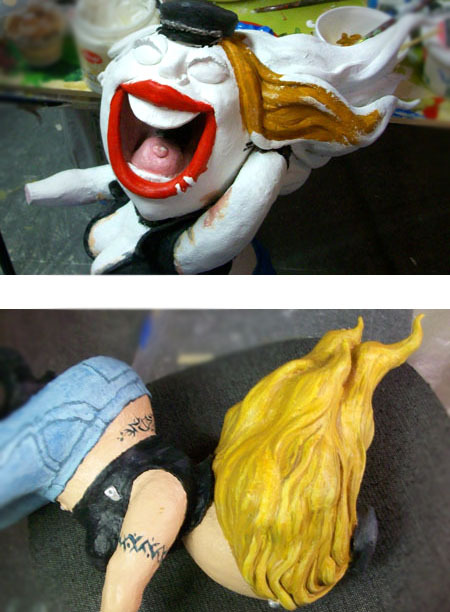 Painting is a favorite part for me.You can see I started her tattoos here—they would have been be virtually impossible to paint on if I had not built her separately from the rest of the sculpture. I make the base last, simply because I find them boring. I usually just use rigid foam reinforced with wood glue-soaked Kraft paper but here I also added a Masonite board to the bottom to assist in stability and add some weight to this somewhat top-heavy sculpture. Major changes. I cut off his head and reposition it to sort of look back at her, so that the characters seem to be interacting a bit more. And then, after being so close to finished, I decided that her mouth is too big and eyes are too high. Major surgery required…. I carve off her upper face, reposition, and fill it in with Jonniclay. Now her mouth isn’t so big, and she actually has some forehead. While I’m at it I make her cap a little bigger. It’s never too late to make corrections. Once everything is properly dry its just a matter of repainting…adding final details like rear-view mirrors, slapping on a coat of varnish and placing stick-on felt furniture cushions on the bottom of the base. I hope you found something of interest here. Your comments are welcome on anything except how incredibly messy my work area is. 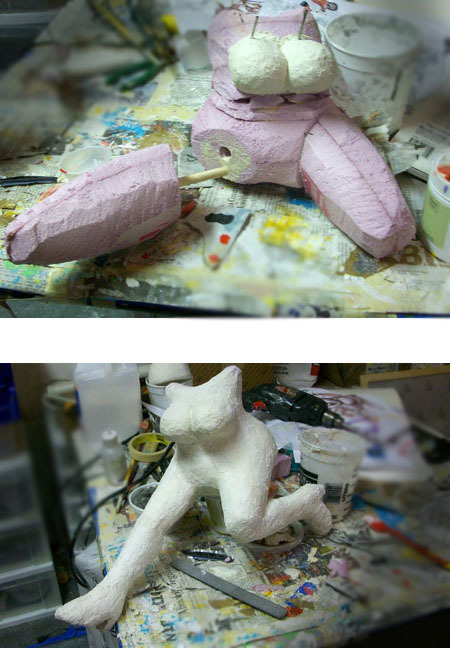 I’m just glad to be done, because I’m already itchy to start my next paper mache sculpt! Muy bueno el trabajo, y vuelvo a decir lo de siempre: ” si sabés dibujar, el trabajo que hagas,será bueno, porque el dibujo es la base de muchas cosas en el arte” los detalles, las líneas, la sombra,Te salió muy bueno el trabajo!! Thank you for opening up your vault..I look forward to employing your techniques and materials to forge a new direction in my own work …papier mache looks exciting to me again, thanks for that and keep up the great work. Steve, your sculptures are amazing! And I love the humor! About that work area … I’m glad to see someone else’s work area as messy as mine always is! I have rolling shelves, clear plastic storage boxes, bins and containers, but where does all my stuff end up? On the work surface of course!! Can’t seem to stay organized! Oh, well, that’s the artist’s bain I suppose. Steve, what do you use as varnish?? Sorry for the late reply Lisa…I haven’t checked here in a while. I use ordinary acrylic varnish…Liquitex or Golden. After seeing this, I went to your website and saw the rest of your work and they are stunning. I am a very simple paper mache person who has made doll furniture and fake rocks for doll photography and pose the dolls to make story lines. I use rocks, a lot of jello cups, choc0late cans and cardboard to make my shapes. That sounds like a lot of fun, and very creative. What a creative way to tell stories! Thnaks for all the detail in how you construct your models. After you have painted and varnished them are they weather proof? I tried putting one of my sculptures outside, but the intense sun cracked the varnish. 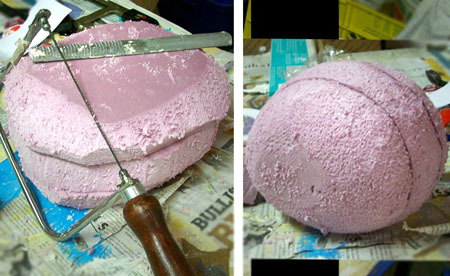 For more information from someone who has actually seen it work, check out this tutorial on waterproofing paper mache by Bob C., one of our regular contributors. LOL, what a great sense of humor you have, Steve! I absolutely love this sculpture. What a fun and instructive post Steve, the beautifully shot photos speak volumes too, thank you! You manage to capture all the charm and humor of your cartoon drawings only more so.. in 3D! Is the glue you used on the wooden dowel and the glue used to stick the pink foam together one and the same glue, is it regular old PVA glue? I had to replace two arms on a humanoid sculpt I’m working on because they cracked with modest handling. I hacked them off and inserted a wire coated with Gorilla glue (the kind activated with a slight water misting) into the remaining stubs and torso and rebuilt them both. I see your driver’s arms looking very thin but they are supported on both “ends”. Is this where you used the Apoxy Sculpt for strength or is there a wire inside them or both? I used either Elmers or wood glue; frankly I doubt there’s much difference for this particular usage—its just to lock the dowel in place. I forgot to show this in my pics, but for his arms and legs I made the upper arms, forearms. thighs and lower legs with rigid foam and Jonniclay separately, connected thru with heavy wire.. After attaching to shoulders(and hips) I could easily “pose” the limbs to the exact positions I wanted—it looked like a marionette. Then it was simply a matter of using masking tape to hold them in position and filling the in-between spaces with Apoxy, or Jonniclay. I did use the Apoxy on shoulders and where wrist met hands. I felt comfortable giving the character such thin arms because the were supported at both ends, like the legs. Actually they act as supports for the torsos as well as the handlebars. Her boots are also Apoxied to the scooter. The thinner and less supported a limb or other shape is, the more delicate it will be, regardless of how much glue, mache or armature you use. Same is true of ceramics or any other type sculpture. I tend towards more complicated designs so I have to accept a certain level of fragility. That’s why I display my sculptures only behind velvet ropes, under bulletproof plexiglass enclosures, with laser intruder sensors and 24/7 armed guards. Even so, they don’t stand a chance against my grandson. Hi Steve, Thank you for the detailed explanation of your thin limb attachment/armature construction approach, most helpful. your work is astounding!! Thank you for sharing….what ideas, what inspiration…. just great. Also, it looks professional, by no means amateur! Great work. in other words…. you appear to be an “expert”!! The only thing missing is a sunburn on the lady! You really bravely took on so many real challenges (the bike alone, but her hair!) I couldn’t believe you got the tongue stud in her deeply carved mouth. It was almost a relief to see that you had to do facial surgery on her, and that it had been a bigger opening when you did the stud. That apoxy stuff looks amazing! Can I ask why you choose Jonniclay over it for the various uses? 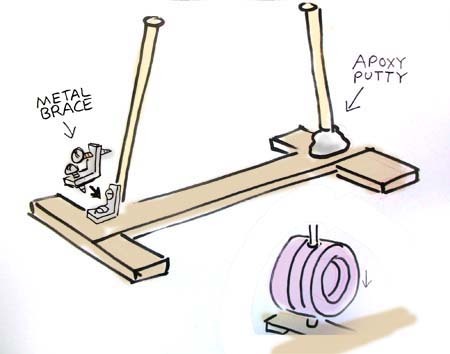 What are the advantages and disadvantages of each: Jonniclay, apoxy and paperclay? Thanks all for the kind remarks. I’m glad you appreciated the corrections of mistakes…one reason I like paper mache is you have all the flexibility you need to “do over”. —paper mache(Jonniclay or paper strips) is cheap, covers large areas, can be supported with armatures, is strong, and has a nice rough texture that I like. It can be made pretty lightweight compared to wood, ceramics or metal. —Apoxy dries rock hard, and thus will be much heavier if used as your only modeling material, and is way, way too expensive for larger pieces. It is more akin to fired pottery clay when dry, and as heavy. That’s why I use it mainly for an adhesive to strongly hold parts together, or for small details. If I had made her face with it no way could I have carved off part of it for a correction. On this sculpt I used it for hair tips, her vest lapels, bike detailing,and unseen blobs here and there to cement hands to handles or bodies to the bike. On other sculpts I’ve used it for things like tails and hat brims. —Creative Paperclay is good for small pieces, but I wouldn’t trust it’s strength for long, thin appendages…I try to use it only for shallow additions, like cheeks, lips or eyes. When used with glue it gets surprisingly tough, but still I prefer it for just the most detailed areas. It also shrinks as it dries, making for possible cracking if the sculpt is too large. And again, it gets pricey if you do larger work. It models extremely well, like a high-quality Play Dough(in fact I’ve used my grandson’s Play Dough Fun Factory toy with it to make long noodle shapes!). It is a pleasure to work with, even easier than pottery clay.Less messy too except for the glue I add to it. I could get by without the Apoxy, but probably not the Creative Paperclay. Ultimately I find Jonniclay will economically get me to 95% of whatever detail I need, and the other two items will supply that last bit of detail that my style requires. On the other hand many folks can get excellent results with just Jonniclay, as seen in the photos on this site. Some prefer a “looser” look to their work. It all depends on what effects you’re trying to get. p.s. I put in the tongue and tongue stud first, THEN added the teeth. I figure this stuff out as I go along…which makes it like a puzzle, as well as accounts for inevitable mistakes along the way. p.p.s. originally she had a tan, but I wanted the tatto to stand out. Thanks, Steve. That’s all exactly what I was wondering. I’m sure that will be super helpful to lots of us wondering when to use what! Had to add, very impressed with the tattoos. Such diligence, to repeat that pattern over and over, and much more fun impact than a simple butterfly or heart-with-ribbon! I think it’s fun to see a biker chick on a scooter – not their usual hot ride… Steve has a wonderful sense of humor, doesn’t he? Whoa, that is just amazing! I can’t wait to see what he does next!! I really enjoyed all the photos and while I usually skim the text I found myself reading every.word! 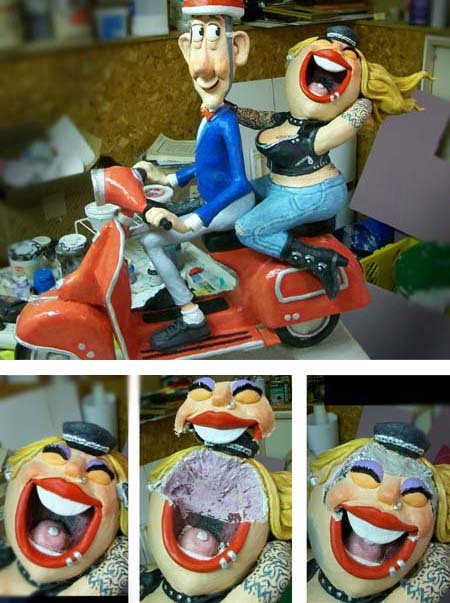 So did I, this is amazing and I will be frank, I will be in the very beginner class of paper mache sculpting. But this article has given me the inspiration to try. This was so great to see how you did that! You are so creative and you made it not seem so scary to make changes. I am so glad to get to read about you and your sculpting. Plenty of ideas for me to try! Thanks for sharing! Wow great work Steve 🙂 Thanks so much for sharing the way you made it and the materials used, also the changes you made during the process, shows us amatures not to be scared of changing things. I am so very impressed. Again thanks for sharing.